Admittedly, this is a bit of a cluttered picture, but it is the kind of scene that won me over for piston transports. This photo was taken in 1991. And "cluttered" is the right word for it: this part of Miami Int'l Airport was nicknamed "Corrosion Corner" and these kind of planes, in various stages of airworthiness (if at all), cluttered an area along NW 36th Street. When this area of the airport was needed for development, these propliners had to move, somewhere around 1995 I think it was. In this shot, out in the open, repairs are being carried out on the fuselage, engine no.4 has been opened up for some attention and the nosecone is missing. "I want to take this opportunity to say that every once in a while I will see someone refer to Corrosion Corner as "Cockroach Corner." This is an epithet, a slur, on the name "Corrosion Corner." As is true for almost anyone who ever worked there, I find it to be an insult. Even the local FAA inspectors didn't use this term. As one of them pointed out in an article years ago, it was a place where a lot of people worked, most of them decent people. A few people were even decorated war heros. For example, one of the pilots who flew out of Corrosion Corner was Pete Fernandez, America's #2 Korean War ace. Corrosion Corner had its origin in the years when that area was primarily used to store aircraft or where aircraft became derelict--approximately the early 1950s to 1971--but especially when International Aerodyne was based there (approx. 1965 to 1971). Even after it became an active area, there were still planes that became derelict--and corroded away. The originator of the term "Cockroach Corner" seems to be Langhorne Bond, FAA Administrator in the Carter years. Bond had a campaign to eliminate propliner operators other than Part 121 air carriers. I have an article from, I think, the Miami Herald in 1978 or '79, where he staged a media stunt, in which he was photographed literally grounding a DC-6 using chains. The DC-6 was N45001 which at that point was no longer owned by a regular operator but evidently was owned by marijuana smugglers. That difference didn't stop Bond, however, from painting all non-carrier propliners with the same 'illegal' brush. In the article, he repeatedly uses the term "Cockroach Corner"
When I see this epithet used, I try to correct it. Recently, I submitted about a dozen corrections to the abpic.co.uk website where the term was used in photo captions. So, thank you to all who use the name "Corrosion Corner," and if you see the other term employed someplace, try, if you will, to correct it. On behalf of the many people who, once upon a time, worked there,"
DC-7C "Seven Seas" N90251 (cn45367) is hown here at Fairbanks,AK August 02nd 1995 with Brooks Fuel. No.4 engine is getting some attention here. The ramp with Brooks Air Fuel is nicely cluttered ! This DC-7C was first delivered to Compagnie de Transports Aeriens Intercontinentaux/TAI January 6th 1958, as F-BIAQ. This company merged with UTA in 1963 and this aircraft was passed on to the French Air Force; for this it was reregistered F-ZBCB. In 1978 it was sold by the French Air Force to Engine Air Ltd and was again passed on to GCA Inc., to whom she was registered in 1978 as N90251. She was seen parked at St. Louis, Missouri in May 1979 with, it seemed, an uncertain future ahead. In July this DC-7C was bought by Commercial Leasing Inc., of New Orleans but she did not move from St. Louis ! Abandoned, she had to suffer the humiliation of unpaid parking bills, a court judgement by the company she was parked with.... and to be sold again by the Sheriff to satisfy that judgement (February 1986). Then the future brightened: T & G Aviation of Chandler,AZ bought her, made her operational again and ferried her to Chandler in September 1986. She joined the other DC-7s in T & G's fleet. There she was configured to a sprayer and went out to do that job in Agadir, Morocco fighting the locusts. The return trip was made in 1990, only to be parked again till 1995, when she was bought by Brooks Air Fuel. The internal tank previously used for insecticide can now be used to haul fuel. It could hold 5.800 gallons of fuel (depending on the type of fuel and performance, of course). 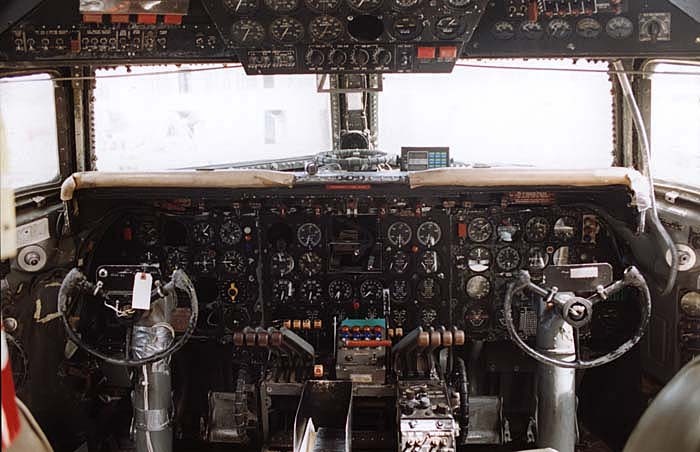 There are plenty of spares for the Wright Turbo-Compound engines, as the engines for the military C-121 Super Constellation, can be used (with some modifications) on this aircraft. Still, there are costs involved and due to "engine overhaul" the aircraft was not flown in 1997 and 1998. 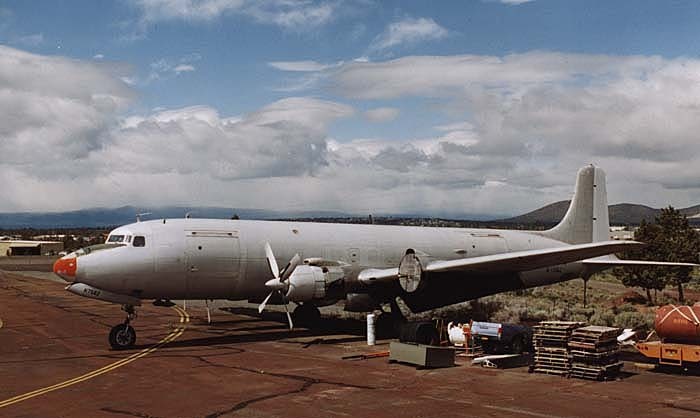 I found it stored at Fairbanks, with little hope of ever to fly again, in 2003.
Credit: the above info on N90251 was learned thru an article in Propliner magazine no.67 (1996) by Karl Hayes & Eamon Power. This one started its career with American Airlines, as N347AA on September 06th, 1957. 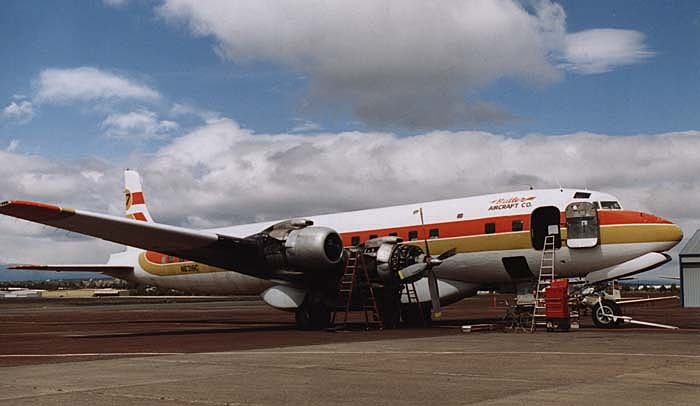 It was reconfigured from a DC-7B to a DC-7BF (Freighter) in 1962. The jet age had begun and the DC-7 was fast loosing ground against the faster jets. There was still a market though, in hauling cargo. West Coast Airmotive bought it in May 1964. This did not last long: it was bought by Zantop Air Transport (of Detroit-Willow Run) in June 1965. Apparently they were not too happy with it, as in 1966 it was registered to Universal Airlines. In 1968 it was bought by BMR Aviation, but they did nothing more than storing it without further use. Butler Aircraft Company bought it in April 1978 (over 10 years of storage !). It was registered to TBM Inc. on a lease from May 1980, but was also used as spares supply... Butler operates as a subsidary of TBM Inc. But meanwhile she had moved to Fresno,CA. It seems that it changed status a few times: on lease to TBM from Butler, but also used for spares. N756Z was seen at Ft. Smith, Arkansas in March 1996 and was back in Redmond,OR in May that year, where I saw her thus. Michael Blank visited Redmond in April 2004 and confirmed N756Z present as spares support. Credit: most of the above data came from Piston Engine Airliner Production List by A B Eastwood & J Roach (TAHS, 1991). Butler Aircraft was a subsidiary of TBM Inc. until Oct06, when it was purchased by Travis and Nan Garnick. Butler retained ownership of the DC-7 aircraft, while TBM kept the C-130s, one DC-6 (T68) and one DC-4 (T65). TBM made the decision to scrap T65 (actually a C-54), and T68. T65 is in Visalia,CA so I have not seen it and don't know its condition. Tanker 68, however, is still here in Redmond,OR. 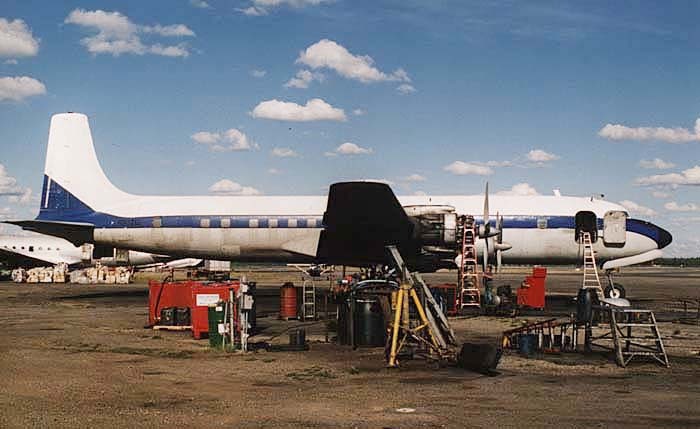 The engines, propellers, landing gear, control surfaces, and other components have been sold to Everts Air Cargo of Alaska for spares for their fleet of DC-6's. Apparently the 2 C-130A's remaining here at Redmond will be moved to Visalia this summer. Butler Aircraft has 3 operational DC-7 aircraft at present: T60, T62 and T66. We also have a DC-7BF freighter, which has not flown for a number of years, but which will be given a detailed inspection later this spring to determine if it can be placed back in service! It could be converted to an airtanker, but could also remain as a freighter. See more images by Ted Quackenbush, on my website, HERE.. I have a little more information for you about the DC7 N756Z. In 1972 I worked for a couple of men who organized a fishing expedition (for lobsters actually) to Clipperton Island. I forgot the coordinates but it is roughly 750 miles due west of Mexico City. The previous year we had a 136 foot boat, a Navy Yard Mine Sweeper from WWII which sunk Dec 26, 1971 off Terminal Island during a gale (I was onboard and barely got off alive). It almost was the end of the operation. But then the two partners raised money and bought or put a down payment on the N756Z in April or May of 1972. They told me they bought it for $65,000. We had problems with an engine, it happened half way to LaPaz, Mexico. By the time we got to La Paz (Baja California), we had to jury-rig a hand pump on a 55 gal barrel of oil, to replace the oil being spewed out the back of the engine and all along the side of her ! Anyhow, we did fly out towards the island but more bad luck (or carelessnes) followed as we flew into a genuine hurricane that we didn't know was coming... With no radar and the storm going full blast, we didn't find Clipperton that day. The plane landed there several times at Clipperton Island. The way it operated was: take a boat there first and set up a homing device, so the plane could follow the signals right to Clipperton. Once we started catching lobsters, the N756Z would fly out to Clipperton and take them back to L.A. A French plane would fly them immediately to France. We (the company formed for the operation) would get $3.50 per pound and a DC7 could haul a lot of lobsters and it looked good on paper. One night a guy got aboard the N756Z at Long Beach Airport with a pistol and he had a stand-off with the police for almost 24 hours ! That story made the front page of the Long Beach newspaper (I think it was called the Long Beach Telegram at that time, but I'm not sure) in July or August of 1972 and they reported in the article the guy claimed he owned the airplane and that he was an ex-CIA agent... I'm sorry to drag this out but now you realize the curious fact that the N756Z couldn't have been in two places at the same time and if you find time and are interested you might have fun tracking down where the plane really was and what it was doing those years that the company said it sat idle. If you think about it, why would anyone in those booming years take a workhorse like the DC7 and let it sit idle in a hangar...? It was still a newer plane then and could really haul a heavy load, I know, I helped load that one ! In Aug.2005 I received another update: " My name is Al Cavallaro and I flew N756Z for Zantop Air Transport out of Detroit Metropolitan Airport in 1965 and 1966. The "Z" in the tail number was a Zantop thing. You mentioned that it was registered to Universal Airlines in 1966. That's true, but the reason it changed owners is not because they were unhappy with it. Zantop Air Transport became Universal Airlines that year. Maybe the new owners tried to get in on contracts for moving troops in and out of Vietnam during the war. N6318C looks grand here, doesn't she ? When I photographed her at Redmond,OR in May 1996 she had been degraded to static engine testbed ! Apparently, she had suffered damage to the mid-spar, as a result of the "bomb runs" she had done while she was Tanker 167. These DC-7s were of course never intended to do that kind of work. Fortunately the damage was discovered during maintenance, it could have ended in disaster ! In this photo she is being prepared to test an engine that has recently been overhauled. Msn 44282 was delivered on October 26th 1954 to United Airlines and dubbed "Mainliner Kauai"; this was changed later to "Mainliner Bakersfield", somewhat closer to home ! Douglas Aircraft Company bought her back in July 1960. In February 1962 she was registered to Aircraft Investment Corp. and went on a lease to Vance Int'l Airways in 1964. This went rather well and Vance Int'l Airways decided to buy her the next year. She was leased to the Argosy Travel Club in 1971. Butler Aircraft Corporation bought her in March 1973. In November 2002 I received an update from Ted Quackenbush via Ralph Pettersen (thanks guys ! ): N6318C was still at Redmond and still being used as a static testbed. For that matter, N756Z was around too, going nowhere. Michael Blank visited Redmond during April 2004 and confirmed it was still in use as an engine testbed; and N756Z was still available for spares support. "I did a little digging on Butler to satisfy my curiosity when I could not find his name in my 474th FG records. It turns out Butler was a P-38 pilot in the 435th FS of the 479th FG. He was shot down in P-38J-15-LO, serial number 44-23168, coded J2-F, on 17 June 1944 near Themericourt, France. He was captured by elements of the 2nd SS and sent to the infamous Luftwaffe hospital at Paris-Clichy. His Missing Aircrew Report Number is 5965." A nice look at the impressive cockpit of N6318C. The prototype of the DC-7, the direct successor to the DC-6 series, flew on May 18th 1953. American Airlines had requested Douglas Aircraft Corporation to come up with an aircraft that could compete with the Lockheed Constellation, which was ordered by rival TWA. Wright Turbo-Compound engines were fitted to 110 DC-7s in the first batch, which still retained many features of the DC-6's airframe; these were followed by 112 DC-7Bs, the prototype of which flew in October 1954 and was paricularly intended for operations across the Atlantic. Pan American initiated a non-stop service New York - London on June 13th 1955. Both of these versions suffered from a number of faults, one of which was an excessive engine noise inside the cabin. This was solved with the DC-7C (which flew for the first time in December 1955); the wing had been restructured to allow for extra fueltanks and which put the engines further outward, away from the cabin. Also the cabin was stretched.